La Côte Amalfitaine : Sorrento, Amalfi, Praiano, Positano, Nocelle, bus Sita, Sentier des dieux, Sentiero degli Dei, Cloître du paradis, Crypte de Saint-André, Basilique du Crucifix, Cattedrale di Sant'Andrea, reliques de Saint-André, Monastère San Domenico, Chiesa San Gennaro. Photos, images, vidéos et descriptif. Visit of Amalfi and walk along the "Path of the Gods" between Praiano et Positano. From Sorrento we took the bus to Amalfi. The road along Amalfi Coast is winding really impressive, probably one of the most beautiful scenic drive. This road links these little towns located on the seaside. As it is higher than the sea level, it offers panoramic views. From 9th to 11th centuries, Amalfi was an important trading power in the Mediterranean, up to the pillage by Pisa, a rival city. The Cathedral including the “Cloister of Paradise”, “St Andrew Crypt” and “Basilica of the Crucifix” bears witness to the glorious past of the city. We started the visit with this baroque style building. In the crypt are claimed to still rest religious relics of the Saint Andrew. Then we went through little streets where there were few tourists. From Praiano we took a path to join the “Path of the Gods” (Sentiero degli Dei), it is a route which offers spectacular views of the Amalfi Coast. 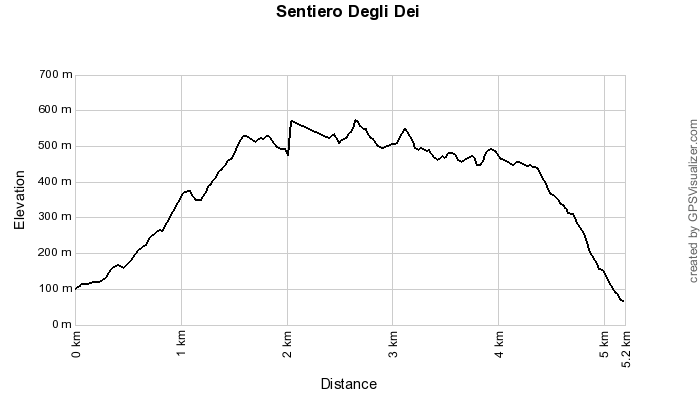 At the beginning the path climbs up steeply, after around 1000 stairs we reached a monastery (San Domenico). Then we had to climb more to finally join the Path of the Gods. There, we are around 500 metres above the sea level, with the island of Capri in the distance. Arrived at Nocelle, we slid down 1700 stairs to join the road. There we took the bus to Sorrento. Between 3 and 4 hours are needed to cover the path. Positano and the Amalfi Coast from the Path of the Gods. With the SITA Bus company it is possible to move along the Amalfi Coast. Timetables are available on their website. The Praiano's tourist office gives useful information regarding the “Path of the Gods”, otherwise these documents can be useful too: here and there.